New bike lanes are being planned for the Denison-Bellevue corridor through Kensington Market from Queen to College. The stretch starting just south of Dundas on Denison up to Wales (seen below) is one that I have been riding the wrong way on for many years now. So I can't wait to see this new contra-flow lane come to fruition. 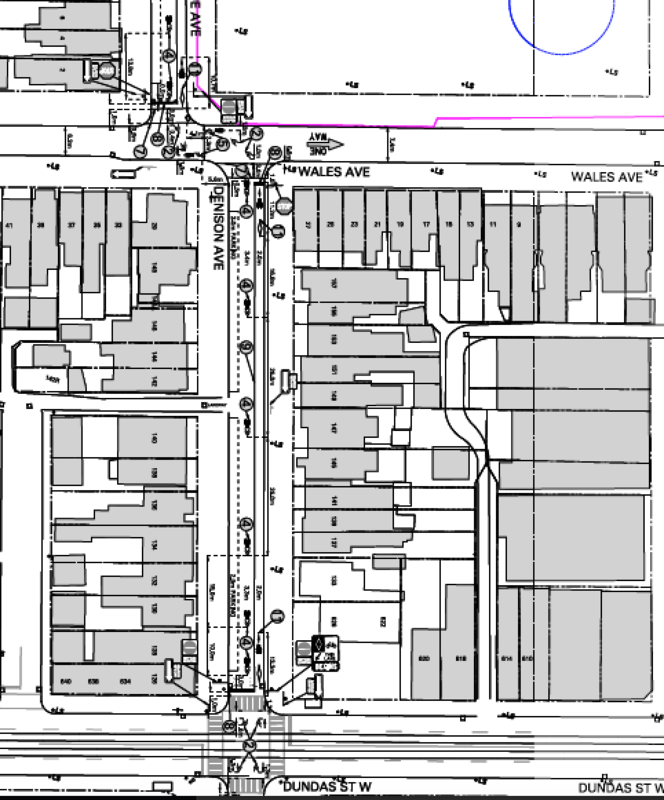 I personally don't mind going a block east to bike north up Augusta, but the contra-flow up Bellevue which is planned as part of this new bike route, should be fairly easy to manage and truly solidify Kensington Market as a place for walking and biking. But what does the community think? 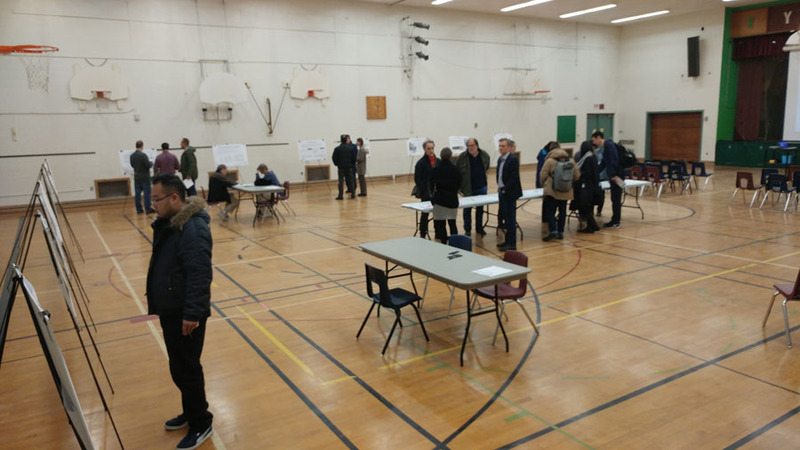 On Monday, November 21, 2016, the City hosted a meeting at Ryerson Public School to show the detailed bike route designs to the public. Unfortunately, there is nothing yet proposed for north of College or south of Queen. 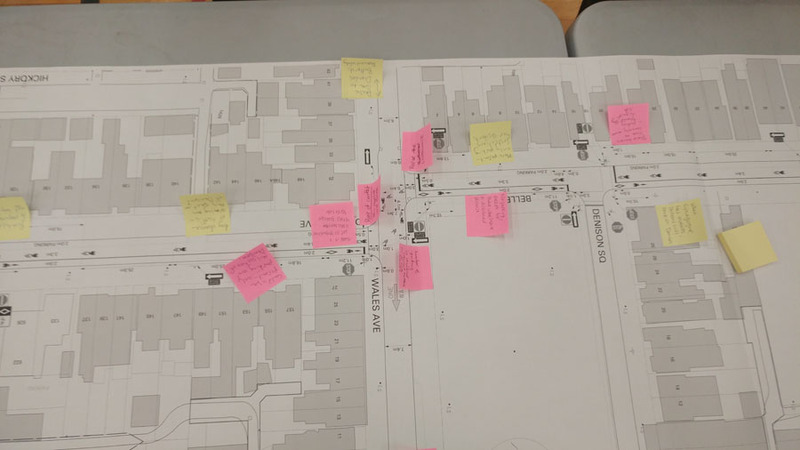 There were no real connections suggested to any other east-west links like the Robinson-Carr-Grange side street options, either, which many cyclists use as an alternative to busy, fast Dundas which is also lined with on-street parking. • Denison Ave., between Queen St. W.
• Carr St. and between Dundas St. W.- Wales Ave.
• Bellevue Avenue between Wales Ave. and 40 m south of College St. W.
These sections of roadway are currently one way southbound. A northbound contra-flow bicycle lane will allow for lawful northbound cycling. A northbound bike lane proposed on Denison, between Carr St. and Grange Ave. In order to paint this bike lane, parking needs to be maintained on one side of the road permanently. For this block, there are more driveways on the west side of the street than the east side of the street. Moving parking to the west side of the street would therefore result in a loss of 7 parking spaces. For this reason, it is recommended that for this block (Carr to Grange), parking be maintained on the east side. While generally the installation of bicycle lanes away from on-street parking is preferred, occasionally the need to supply parking will lead to the investigation of bike lane next to existing parking spaces. 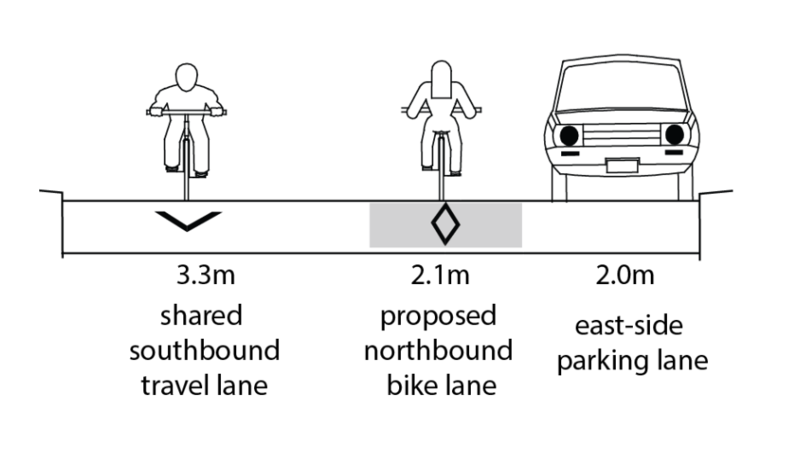 The City of Toronto's transportation department states that it has found that the installation of contra-flow bicycle lanes next to parking may be supportable, provided the roadway in question is a local street, and the design only places the bike lane next to parking for limited sections. Hmm, okay. Here's a lovely contra-flow lane on Montrose below which is not built n the dreaded "door zone." Toronto has been installing contra-flow bicycle lanes since the 1990s. Locations include streets from a wide variety of neighborhoods, including Shaw, Argyle, Florence, Simcoe, Stephanie, Phoebe and on Colborne Lodge Road in High Park. Montrose (pictured above) was one of the city's first contra-flow lanes. "Investing a Minimum Grid policy is critical to building a cycling and transit network that is safe and accessible in our City. We're working hard to expand the grid in Ward 20 – the Bloor bike lane pilot, bike lanes on Peter, Simcoe cycle-track extension, and more. The Bellevue-Denison contraflow lane will provide a critical North-South cycling connection, a first step in the work to bring cyclists from Dupont down to the Waterfront. We know that many cyclists currently use quieter, one-way streets to move through the City. 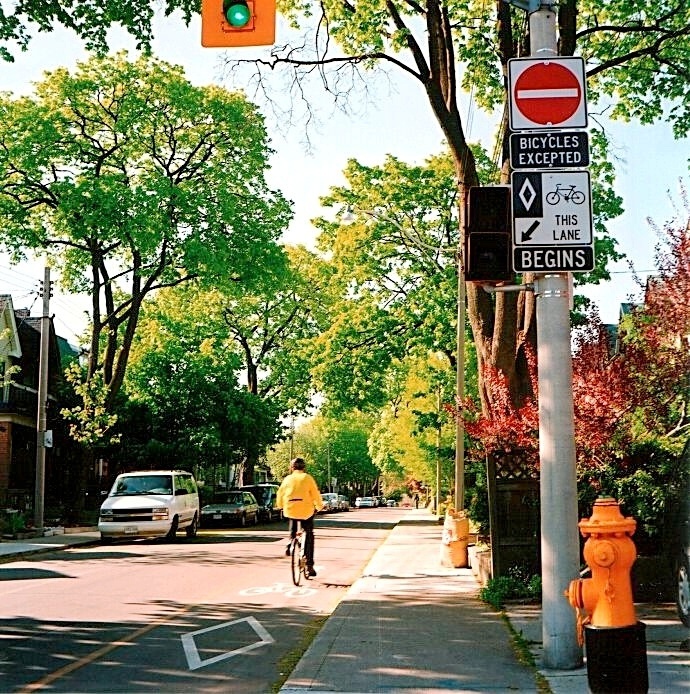 Installing contraflow lanes on these streets provides a designated space for all users, and connects with critical corridors like College Street, as we continue to build our City's cycling grid." Time lines for next steps are still to be determined, but let's hope the City provides cyclists with a lot more north-south routes next year. City staff will wait for water main and other underground utility work before planning any cycling route (re)painting. Following the consultation period, staff will use feedback to inform preferred design solutions and report to City Council in 2017. In the meantime feedback can be sent to bikeplan@toronto.ca or by phone at 416-338- 1066.